Want to experience Vietnam's village life in a remote setting? Learn how to cook sticky rice in bamboo? Get your hands dirty transplanting rice? Taking to our bikes we are out in the countryside and engage with kids playing and chickens crossing the road. Spend time with the local hill tribe people, the White Thai, and get to know their daily routines when we spend two nights in a homestay. Meet monkeys, gibbons and the quirky pangolin and interact with the conservation efforts at two rescue centres on the edge of Cuc Phuong National Park. Try rowing a sampan boat with your feet and cooking a traditional Vietnamese dinner. From your Hanoi hotel drive 4 hours to Mai Chau, a rural town in Hoa Binh province, southeast of Hanoi. The scenery is dotted with limestone karsts and ethnic highlanders of White Thai, Hmong, and Zao living in the small villages that we pass along the way. We stop at the top of a pass for a panoramic view of stunning Mai Chau Valley so you can get an overview of where we will be cycling. We start pedaling on small paths, past green rice paddies and local stilt houses, and of course meeting friendly local villagers. Taking a break at Hoa Ban Plus, a weaving centre and living complex for disabled women, gives us a chance to see the traditional handicraft of weaving in action, and we can even give it a try. We continue cycling on to our homestay overnight at Pom Coong village. We sleep in stilt bamboo house in an open dormitory-style room with shared facilities. After breakfast, we ride up to the hills along a dirt road frequently used by local villagers. As we climb, the valley views open up to boundless, spectacular scenery. A steep 2 km climb is rewarded with a 10 km downhill through rustic villages and lush terrain. A quiet paved road and a small trail leads us to the White Thai village of Buoc. We can take a short walk around and learn about local village life, visit a few households, and see where families cook and sleep. We help with preparing lunch by making “Com Lam”, traditional sticky rice in bamboo. With a belly full of local delights, we cycle back to Mai Chau and have the rest of the afternoon free. We drive one hour drive to Cho Lo where we then get on the bikes. A flat ride on country roads follows where we'll have to watch out for chickens crossing the road and give right of way to water buffaloes. A bowl of Pho, noodle soup, will hydrate and fill us. Be sure to add in the greens, herbs, spicy pastes, and a squeeze of lime to make the soup taste to your liking. 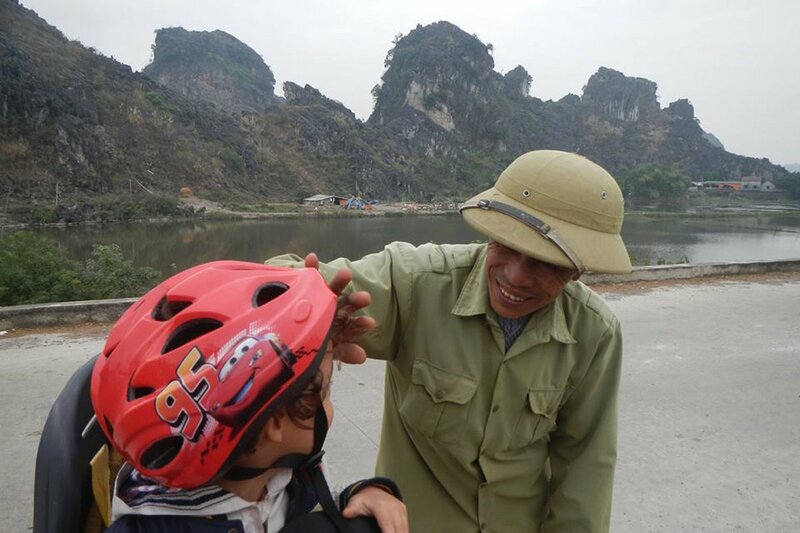 A short transfer takes us uphill to Cuc Phuong National Park in Ninh Binh Province, the oldest national park in Vietnam and its most significant biodiversity site. Time to get wild! A guided tour of a rescue centre where monkeys and gibbons are being rehabilitated to return to the jungle will show you how many species there are in the jungle. After seeing the antics of the monkeys it's a short walk to the Carnivore and Pangolin Education Centre, where we'll learn about and see civets and the unusual pangolin with their protective armour of scales and long tongues for capturing ants and termites. The rescued animals are in well-designed, spacious enclosures, and the centre offers interactive displays to understand the threats to wildlife and learn about conservation. A fun and educational afternoon with wildlife! A feast for the senses today, from the sight of the towering karsts to the sound of the river to the taste of our self-cooked dinner. Cycling from our guesthouse, we go downhill before riding along a dyke that provides a flat and safe ride, to the town of Hoa Lu. An ancient capital of the Dinh and Le Dynasties, we step back in time and visit a 17th century temple built in the shape of a Chinese character. After lunch, we change from bikes to boats and relax and enjoy the amazing mountains that dominate most of the region. We are rowed through a cave by local sampan rowers who use their feet to oar and enter a green and fertile land. Back on land, we head to our resort amidst rice fields. Another hands on meal as we assist in the preparation, learning the best technique to roll fresh spring rolls, and then feast on our creations. A change of pace as we get our hands dirty. Cycling away from the karsts, we follow numerous rivers as they reach toward the coast. The scenery changes to flat plains as we cycle into the delta, a guaranteed flat ride. We take a break at Phat Diem Stone Cathedral, which has a unique blend of eastern and western architecture illustrated by its pagoda-styled roofs. We transfer to Bat Trang, a ceramic producing village that makes giant vases. Make your own souvenir tea cup or bowl using local techniques. Then it's time to head back to Hanoi for your onward travel. A great holiday for children and adults. Lovely guides, good quality cycles and interesting activities. Riding through rice paddies and villages was a wonderful way to experience rural Vietnam. The hosts were very friendly and sleeping in the traditional houses was great. Tour MeetsAt your hotel in Hanoi. Tour EndsAt your hotel in Hanoi. We ride a total of 162 kilometres through spectacular limestone mountain scenery, bright green rice fields, and charming villages. The roads are a mixture of good asphalt, small rural trails, and dirt roads– all perfect for a family of cyclists. Each day there will be additional activities to learn about Vietnam, immersing yourself hands on in the culture. A highlight will be an afternoon with monkeys, gibbons, civets, and pangolins! The first two nights we stay in a village at a homestay. We sleep in a stilt bamboo house in an open dormitory-style room with shared facilities. There is the option to upgrade to a hotel with a pool. Please contact us for the cost. Suitability: This trip is designed and suitable for families with children of any age. We have included many activities for an action-packed holiday. The tour is suitable for anyone with minimal biking experience and wants to discover Vietnam's rich history and culture by bicycle. Biking Conditions: You can expect a gentle ride each day. The cycling is leisurely with plenty of stops to rest or take photos. We cycle on a variety of terrain, from tarmac to concrete paths to dirt roads. There are a few small hills, but there will always be the option to jump in the support vehicle. Cycle as much or as little as you like. Our guide will pick you up at your Hanoi hotel to start our 4 hour drive to Mai Chau, a rural town in Hoa Binh province, southeast of Hanoi. The scenery is dotted with limestone karsts and ethnic highlanders of White Thai, Hmong, and Zao living in the small villages that we pass along the way. We stop at the top of a pass for a panoramic view of stunning Mai Chau Valley so you can get an overview of where we will be cycling. We check into our lodging, have lunch, and then it's time to get on the bicycles and explore the valley. We start pedaling on small paths, past green rice paddies and local stilt houses, and of course meeting friendly local villagers. Taking a break at Hoa Ban Plus, a weaving centre and living complex for disabled women, gives us a chance to see the traditional handicraft of weaving in action, and we can even give it a try. You'll leave with a new appreciation for fabric after seeing how complex and time-consuming it is to produce. We continue cycling on to our homestay overnight at Pom Coong village. We sleep in stilt bamboo house in an open dormitory-style room with shared facilities. A feast for the senses today, from the sight of the towering karsts to the sound of the river to the taste of our self-cooked dinner. Cycling from our guesthouse, we go downhill before riding along a dyke that provides a flat and safe ride, to the town of Hoa Lu. An ancient capital of the Dinh and Le Dynasties, we step back in time and visit a 17th century temple built in the shape of a Chinese character. After lunch, we change from bikes to boats and relax and enjoy the amazing mountains that dominate most of the region. We are rowed through a cave by local sampan rowers who use their feet to oar and enter a green and fertile land. Back on land, we head to our resort amidst rice fields. Another hand on meal as we assist in the preparation, learning the best technique to roll fresh spring rolls, and then feast on our creations. Bike hire is included in the tour. Child bikes and tag-along bikes (for ages 5-11, max. weight: 38 kg/85 lb) are available. Adults must be experienced riders to pull a tag-along and preferably have experience with tag-alongs. The bikes are well-known makes of hybrid or mountain bikes (depending on the tour) with lightweight alloy frames, 24- to 27-speed gearing, v-brakes, and Shimano components and front suspension.